The best I can give this book is a half-hearted ‘meh’. I’m so disappointed, because I do love a good zombie novel, and the synopsis sounded very interesting. The cover of my edition proudly quotes The Times: “A dark futuristic satire laced with fiendish humour”. I don’t know what book the reviewer at The Times was reading, but it wasn’t the same Zone One I got. There were elements of satire, but they either felt forced or were poorly executed and fell flat. There were also some quite touching moments of friendship, which felt completely at odds with the rest of the narrative. The novel got off to quite a good start, and there were moments of brilliance which shone through, keeping the star rating at 3 rather than the 2 I considered giving it. 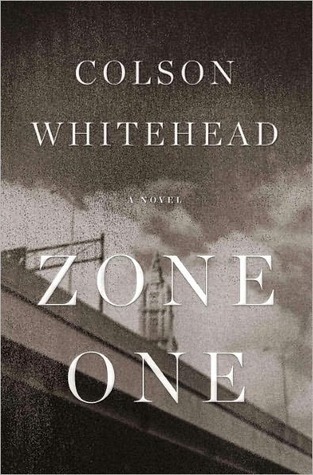 Whitehead has a real gift for evoking a particular mood for a scene, and one of my favourite lines in the whole book is the description of the feeling while walking through abandoned New York city in the fog: “He was an insect exploring a gravestone: the words and names crevasses to get lost in, looming and meaningless”. Unfortunately this quality is not consistent, and the book suffers for it. There were two other things that annoyed me about this book. First of all, the complete lack of chapters. The book is divided into three ‘days’, representing the Friday, Saturday and Sunday that the main plot takes place over. I am all for experimenting with form and convention, but it just didn’t work. There was nothing to break up the monotony, and it lead to a lot of confusion about timelines. Which brings me neatly to the second thing that annoyed me: the timeline or lack thereof. Time periods jumped around with no consistency from paragraph to paragraph. It was often so unclear whether it was long past, recent, present or future (or dozens of other points in between) that I had to reread whole pages trying to figure out what was going on. These approaches can create tension, put a reader outside their comfort zone and challenge them, which are all good things, but in this case it just missed the mark. I let go of my high expectations about a third of the way through, and probably wouldn’t have finished it if I wasn’t going to discuss it with Book Club next week. There are dozens of better zombie books out there and much better satire of society. I wouldn’t recommend this book unless you are the kind of person who enjoys reading 259 pages of ‘character development’ only for the book to end with a pun on the main character’s name.